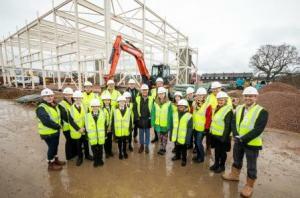 Students from The Bulmershe School and Addington School in Woodley were invited onto the Bulmershe Leisure Centre site to celebrate the start of the new centre’s steel frame being erected. Wokingham Borough Council is building a new £14million leisure centre in Woodley on the site of the former one. It will include a six-lane 25-metre swimming pool, a teaching pool with movable floor so larger numbers of groups of ages and abilities can use it, a bigger gym plus a ‘live well’ (long-term condition) gym, a four-court sports hall, and an additional studio and café. It is being designed to benefit the whole community with accessible and flexible facilities, and preventative health services. “This is always the exciting point in a project like this, because this is when you start to see it take shape,” said Cllr John Halsall, executive member for environment, leisure and libraries, who joined the students at the site along with representatives from the borough council. The new centre is due to open next summer and be run by our partner Places Leisure.